The America’s Cup is the most famous and most prestigious regatta and Match Race in the sport of sailing, and the oldest active trophy in international sport. It was formerly known as the Hundred Guinea Cup and was the prize for the race around the Isle of Wight. The sport attracts top sailors and yacht designers because of its long history and prestige as the pinnacle of yachting. Although the most salient aspect of the regatta is its yacht races, it is also a test of boat design, sail design, fundraising, and management skills. The cup, originally offered as the Royal Yacht Squadron cup, is now named after the first yacht to win the trophy, the schooner America. During the year of the first World's Fair, American boatbuilders' reputation grew throughout the boating world. With the energy of the fair behind them, several New York businessmen persuaded John C. Stevens, a Commmodore of the new New York Yacht Club to sponsor a yacht against British competition for money. After Stevens discussed the idea with his friends James Hamilton, Georeg L. Schuyler, Hamilton Weeks, and J.B Finley they decided to ask a successful ship maker by the name of George Steers to build the winning boat. Steers obliged and even offered to give the team $45,000 of his own money if the America boat lost. When the boat sailed six days from New York bound for the course at Le Harve, the British opposition did not know what to expect. When news hit that the boat was amazingly quick, the American Commodore could hardly land a bet for the race. When the 30.86 meter long schooner-yacht finished twenty minutes ahead of the field without another boat in sight, the bettors were proved right. Stung by this blow to contemporary perceptions of invincible British sea power, a succession of British syndicates attempted to win back the cup, but the New York Yacht Club remained unbeaten for 25 challenges over 113 years, the longest winning streak in the history of sport. Matches were held in the vicinity of New York City from 1870 and 1920, which includes the “Herreshoff Period” between 1893 and 1920, when cup defenders were designed by Nathanael Herreshoff. From 1930 to 1983, the races were sailed off Newport, Rhode Island for the rest of the NY Yacht Club’s reign. One of the most famous and determined challengers was Scottish tea baron Sir Thomas Lipton. Between 1899 and 1930 he mounted five challenges, all in yachts named Shamrock, two of which were designed by William Fife. One of Lipton’s motivations for making so many challenges was the publicity that racing generated for his Lipton Tea company, though his original entry was at the personal request of the Prince of Wales in hopes of repairing trans-Atlantic ill-will generated by the contentious earlier challenger, Lord Dunraven. Lipton was preparing for his sixth challenge when he died in 1931. 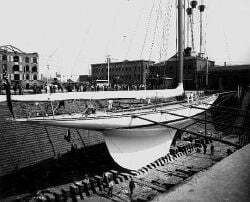 The yachts used during the Lipton era were very large sailing sloops; for example, Shamrock V, which is still sailing today, measures 120 feet (36 m) long. After World War II, the huge and expensive J-class yachts were replaced by the much smaller 12-meter class yachts, which measure from approximately 65 feet to 75 feet (20 to 23 m) overall. The New York Yacht Club’s unbeaten streak continued in eight more defenses, running from 1958 to 1980. The inventor of the cunningham sail control device to increase performance, Briggs Cunningham, skippered the Columbia during its 1958 victory in the first challenge after 1937. Alan Bond, a flamboyant and controversial Australian businessman made three challenges for the cup between 1974 and 1980, failing all three times, including a loss to Ted Turner in 1977, who skippered Courageous. He returned in 1983 with a golden spanner which he claimed would be used to unbolt the cup from its plinth, so he could take it home. In 1983 there were seven foreign challengers for the cup. Bond’s campaign, representing the Royal Perth Yacht Club, won the elimination series for the “right to challenge” the NY Yacht Club, the prize for which was the Louis Vuitton Cup. In the challenger series, Bond’s Australia II, skippered by John Bertrand and designed by Ben Lexcen won easily. The Australians recovered from a bad start to win the America’s Cup 4-3 in a best-of-seven format and break the 132-year winning streak. Beaten skipper Dennis Conner won the Cup back four years later, with the yacht Stars & Stripes representing the San Diego Yacht Club, but had to fend off an unprecedented 13 challenger syndicates to do it. Bond’s syndicate lost the Defender series and did not race in the final. In 1988, soon after Stars and Stripes’ victory had redeemed Dennis Conner’s reputation but before the San Diego Yacht Club had publicly issued terms for the next regatta, a New Zealand syndicate, led by merchant banker Michael Fay, lodged a surprise “big boat” challenge under the original rules of the cup trust deed. The challenge used a gigantic yacht named New Zealand (KZ1) or the Big Boat. Fay had challenged using the maximum size yacht possible – even larger than a J-class yacht – which was swiftly built and presented for the contest. Conner’s syndicate, however, recognized that a catamaran was not expressly prohibited under the rules. Catamarans, due to lower mass to sail area ratios and other factors, are in general vastly quicker than monohulls. Conner did not leave anything to chance, however, and commissioned a cutting-edge design with a wing sail, also named Stars and Stripes. A legal battle ensued over whether Conner or Fay had broken the rules or if both had merely skirted the edges of them. The teams were directed by one American court to compete in the race, which New Zealand predictably lost by a huge margin. A second court then awarded New Zealand the cup, only to have a third court decide the San Diego Yacht Club should hold the cup. In the wake of the 1988 challenge, the International America’s Cup Class (IACC) of yachts was introduced, replacing the 12-meter class that had been used since 1958. First raced in 1992, the IACC yachts were used until the 2007 America's Cup. The debut of the IACC yachts were developed to use the advantage of their new technology with carbon fiber used to construct the masts and hulls. This led to faster and lighter boats with a much larger sail area than the previously used yachts. New rules were also introduced that gave heavier boats more sail, and also helped lift restrictions that were previously put on the underwater and beam construction. 1. "Observer"- One non-executive place is kept for the owner or his nominee; on early racing days this might be one of the designers. 4. "Navigator"- Plots the optimum course between market buoys using a sophisticated array of wind direction and speed instruments, together with satellite navigation displays and weather data. 5. "Mainsheet Trimmer"- Adjusts the shape of the mainsail, tensioning the mainsheet on the winch with the traveler; positioning the boom correctly over the boat. 6, 7. "Headsail Trimmers"- Responsible for adjustments to the weather, port or starboard (jib) sheet. They may often be heard shouting instructions to the grinders. 8-12. "Grinders"- Chosen largely for muscle-power, their job is to hoist the sails and adjust them as quickly as possible by tensioning the sheets using the "coffee-grinder" winches. 13. "Spinnaker Trimmer"- He has to think quickly and make rapid alterations to the set of the spinnaker. A key member of the crew. 14. "Sewer/Halyard Man"- Picks the parachutes to the pit below decks and feeds sails to the deckhands through the sewer or forehatch. Mans the sail halyards. 15. "Foredeck Hand"- Helps the bowman position the massive spinnaker pole, liasises closely with the swer man and helps hoist, stow and generally handle the sails. 16. "Bowman"- The hero who organizes all the sail changes and acts as a forward lookout. In rough weather the bowman has the most difficult task and may be constantly under water. In 1992, USA-23 of the America3 team, skippered by billionaire Bill Koch and sailing legend Harry “Buddy” Melges, defeated the Italian challenger Il Moro ITA-25, owned by billionaire Raul Gardini’s Il Moro di Venezia 5-1. (Team New Zealand led 4-1 in the Louis Vuitton final before a protest by the Italians about the use of Team New Zealand’s bowsprit for certain spinnaker maneuvers, allowed the Italians to come back and narrowly advance to the cup final). In 1995, The Royal New Zealand Yacht Squadron syndicate Team New Zealand, skippered by Russell Coutts, first won the challenger series in NZL 32, dubbed Black Magic because of its black hull and uncanny speed. Black Magic then easily defeated Dennis Connor’s Stars & Stripes team 5–0 to win the cup for New Zealand. Although Stars & Stripes won the defender selection trials sailing “USA-34” they decided to sail USA-36 to defend the America’s Cup. USA-36 was the yacht campaigned by the Young America team in the defender trials and beaten by USA-34. The 1995 Cup was notable for the televised sinking of oneAustralia during the fourth round robin of the Louis Vuitton challenger selection series. Luckily no-one was injured during the incident. The Australians advanced to the Louis Vuitton final using their second boat. Team New Zealand won the Louis Vuitton final 5-1 over oneAustralia. In March 1997, a person entered the Royal New Zealand Yacht Squadron’s clubroom and damaged the America’s Cup with a sledgehammer. The attacker, a recidivist petty criminal, claimed the attack was politically motivated; he was convicted and sent to prison. The damage was so severe that it was feared that the cup was irreparable. London’s Garrards silversmiths, who had manufactured the cup in 1848, painstakingly restored the trophy to its original condition over three months, free of charge. At Auckland in 1999–2000, Team New Zealand, led by Peter Blake, and again skippered by Russell Coutts, defeated Challenger Italy’s Prada Challenge from the Yacht Club Punta Ala. The Italians had previously beaten the AmericaOne syndicate from the Saint Francis Yacht Club in the Louis Vuitton Cup Finals. This was the first America’s Cup to be contested without an American challenger or defender. In 2003 several strong challengers vied for the cup in Auckland during the challenger selection series. Notably a number of original members of Team New Zealand including previous helmsman Russell Coutts were key members of the Swiss challenge “Alinghi” sponsored by pharmaceutical billionaire Ernesto Bertarelli. Alinghi advanced surprisingly comfortably through the Louis Vuitton series into the America’s Cup final. The Alinghi team won the America’s Cup with surprising ease (5-0), multiple gear failures not helping Team New Zealand’s defense. It was announced on November 27, 2003 that Alinghi would defend the America’s Cup in 2007 in Valencia, Spain, the first time since the original 1851 Isle of Wight race that the America’s Cup has been held in Europe. The deadline to challenge for the 32nd America’s Cup was April 29, 2005, by which time 11 challengers from 9 countries had submitted formal entries. The challenger selection series, the Louis Vuitton Cup 2007, began in Valencia on April 16, 2007 and concluded on June 6, 2007 after 122 matches. Emirates Team New Zealand won the challenger series 5-0 against Italians Luna Rossa and met Alinghi between June 23 and July 3, 2007. Alinghi successfully defended the America's Cup on July 3, 2007 by beating Emirates Team New Zealand 5-2. The racing was much closer than the scoreline suggests including a 1 second winning margin by Alinghi in the seventh and final race. The protocols for the 33rd America's Cup were released on July 5, 2007. The protocol agreed to with Club Náutico Español de Vela, the Challenger of Record, will feature boats of 90 feet in length and crews of up to 20. The 33rd America's Cup will be again the Mediterranean city of Valencia and it will take place in May - July 2009 . The Golden Gate Yacht Club has lodged a complaint against the Société Nautique de Genève in New York Supreme Court, New York County pleading violations of the Deed of Gift (the deed specifies the NY Supreme Court is the arbiter of last resort). The suit alleges that the Spanish club does not meet the terms of the Deed of Gift as a legitimate yacht club that would qualify to be the Challenger of Record. At the start of the race, the sport was not viewed by many spectators. It was not until after more than a decade of competition that the Prince of Wales, later on known as King Edward VII, started to visit Cowes for the race. Today the course would not be an ideal place for competition, but at the time was a good place to host the event because the local boats had a no advantage over the Americans because of the swift currents. In 1844 the New York Yacht Club created two race courses approaching the harbor for the cup. The first ran inside Tompkinsville and by the shores of Staten Island. As with the Isle of Wight, local advantage did not exist because of the currents. Its first time hosting the cup was in 1870 with ocal steamboats circling the racers with positive reinforcement, and bands playing songs such as Yankee Doodle and God Save the Queen. Some of the larger boats had more than 300 spectators, and were a risk for blocking the path of the yachts. It was because of this that in 1887 the inside course was discontinued because it gave an advantage to the quicker, skinnier American boats. The outside course was very convenient because it eliminated a race with a lack of wind, and challenged all the racers as if they were on the open water. The triangle course made the tougher conditions a real variable during the cup. In 1871 the boat Livonia couldn't pass on the correct side, disqualifying the boat. As was the case with the first New York course, the outside course was questioned as spectator crafts continued to increase. Mike Vanderbilt ordered a new course to be made in Rhode Island. From 1930 to 1962, the cup made its home in Newport and soon enough, the new area developed its own environment for the race. World War II limited spectators, but within time the town became a paradise for sailing fans. According to Ranulf Rayner's book on the race, mansions soon were filled by crews, streets became traffic jams, and the shops in town became virtual museums for the America Cup. At the Newport course, committee boats would judge the weather for the day, and use buoy's to mark the race points. Revised Course In 1964 a new course was created in Newport to create less of an advantage for boats downwind. With the new course, the hazards were still just as difficult, but the speed increased significantly. This made the race much more slick and exciting, as decisions were even more vital and needed in a quick amount of time. On October 30, 1983 over 900,000 people showed up to congratulate the winners from Australia. This led to a ton of publicity for the nation, and in 1987 hosted the cup. The new location was beautiful, but the course was deadly. As soon as the Royal Perth Yacht Club took home the cup, they set up a special committee to design a tight, demanding, 11-mile course that would set up the host nations strengths. With the new course came new marinas, and the teams that made the trip were greeted by the fast winds, and wild seas that the Aussies set up. When Dennis Conner left Perth victorious, he was left with the decision of the new location. Many speculated on its location, with some thinking Conner would head to Hawaii, the location he used to train for his 1987 victory. The rough Hawaiian sees were passed over, and the race headed to San Diego. The course in 1992 was set up for a explosion of excitement with several hairpin turns, and the first ever downward finish. Even though the course was new and difficult, the atmosphere did not match that of previous locations. The course from 1995 to 2003 was hosted by the Kiwis, with no more preparation and attention given to the process to host the 2000 Olympic Games. The America’s Cup series of races, particularly Dennis Conner’s quest to regain the Cup after losing it to Australia and winning it back in the subsequent series, was used as the inspiration for the 1992 film Wind starring Matthew Modine and Jennifer Grey. Traditionally, commercial airships or blimps built by the Goodyear Tire and Rubber Company, of Akron, Ohio, USA, have been named after former America’s Cup winning boats. Paul W. Litchfield, an early chairman of Goodyear, envisioned airships as “the aerial yachts of the wealthy” and began the tradition of naming blimps after A.C. boats, in 1925, with the christening of the Pilgram. The tradition continued with Goodyear blimps named Stars & Stripes, Columbia, Ranger, Rainbow, Enterprise, Resolute, Reliance, Defender, Vigilant, Volunteer,, Mayflower, Puritan and America. ↑ Ranulf Rayner, The Story of The America's Cup 1851-2003 (Warwick House Publishing, 2003). ↑ 33rd America's Cup details published: Valencia, in 2009...and more Retrieved October 29, 2007. ↑ Supreme Court of the State of New York.GGYC Complaint Against SNG Retrieved October 29, 2007. This page was last modified on 22 March 2016, at 21:38.